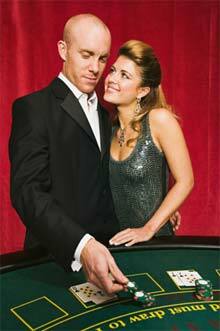 Blackjack, or Twenty-One game, or Vingt-et-Un is the most famous card table game in the world. It is played with 52-card deck, and the main aim of the game is to get the 21 total score without exceeding this sum. The game has many variations and is played in every casino. The outcome of the game depends not only on the gambler's luck, but also on his/her math skills and usage of the blackjack basic strategy, giving a set of advice how to play the particular hands. Any gamer so want to have experience, free online casino games give the chance to obtain it. 1st Step - the gamblers place their bets on the special place on the table. 2nd Step - the banker deals two cards to everyone at the table. He takes them from the special cards shoe, or the shuffling machine distributes the cards. The player's both cards are face up, and one of the dealer's cards is face down. 3rd Step - the gamblers make their decisions, and the last one decides what to do is the croupier. 4th Step - the dealer announces the winner, and the wagers are dealt. Hit - take an additional card. To signal about this decision, the gambler should touch the table or wave his/her hand. Stand - the player is satisfied with the result and stands with the present score. To inform the dealer about the chosen option, the player should slide his/her cards under the playing chips. Double Down - the process of doubling the initial wager, possible in a case, when the player is satisfied with his result and is sure in victory. The gambler places additional chips near his/her wager and points with a finger. Split - the option of dividing the first two paired cards and playing them as separate hands. The gambler places the additional betting chips near the initial wager outside the special betting box. Surrender - the procedure of giving up a half-wager and retiring from the game. The face cards - Jack, Queen, King - are counted as 10 points, the Aces can be counted as 1 or 11 points, according to the player's decision. The other cards - 2s-10s possess their face value. The best game combination is called "Blackjack" or the "Natural". It contains an Ace and one of the 10-valued cards (they should always be the initial two cards). The 21 combination after the splitting doesn't pay as the blackjack. The winning blackjack combination beats any hand. The regular payment for the blackjack hand is 3:2. You should remember that blackjack game has many rule and playing variations, so playing in the land based or online casinos read the rules and conditions very attentively.